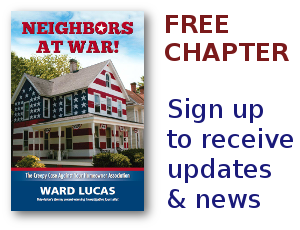 HOA Stories Archives - Neighbors at War! HOA Swingers! Ya Gotta Love It! No Comments on HOA Swingers! Ya Gotta Love It! I don’t know much about swingers’ clubs. Yeah, I’ve been on a few vice raids in my career of such clubs. And one such raid was on a home in Greenwood Village, a super-ritzy HOA just south of Denver. Even for a hardened investigative reporter it was pretty eye-opening. So this headline caught my eye. Seems that an HOA lawsuit against a Texas homeowner may lead to some interesting discovery, i.e., the guest list of all those who’ve attended swingers’ bashes in the past few years. One doesn’t usually think of HOAs as being bawdy. But as a former Texan, I can say that Texans can be just as raunchy as people in any other state. Just amazing! Just in time for Christmas, counties in Florida are offering rewards for turning in criminals. Just look around your HOA and you can find plenty of board members and property managers who are stealing, bribing, defrauding and embezzling from homeowners. There’s your Christmas money. Just take this advice from a long-time investigative reporter. Whenever the cops ask you to anonymously call an 800 number, the dirty secret is that you’re not anonymous. The Crimestoppers 800 number is a complete and total scam. Call from a phone booth.